New Delhi: The finals of WCL #T20 Inter-College Talent Hunt Tournament played at Roshanara Club, New Delhi today between the most deserving women cricket teams of JMC College & Gargi college was won by Jesus & Mary College (JMC) who beat Gargi college by 37 runs. Jesus & Mary college (JMC) won the toss and elected to Bat. Jesus & Mary college (JMC) scored 88 Runs losing 9 wickets in 20 overs. Gargi College were all out for 51 runs. The Award Ceremony was graced by former India captain Bishan Singh Bedi, ‘Dronacharya’ Cricket Awardee Sunita Sharma & other eminent Sports Personalities. The winning trophy was awarded to the Captain and the team of JMC College by Shri. Bishan Singh Bedi, Former India Captain at the Award Ceremony held at Roshanara Club amongst all the Chief Guests, participating teams, Coaches, Umpires, eminent Sports Personalities. 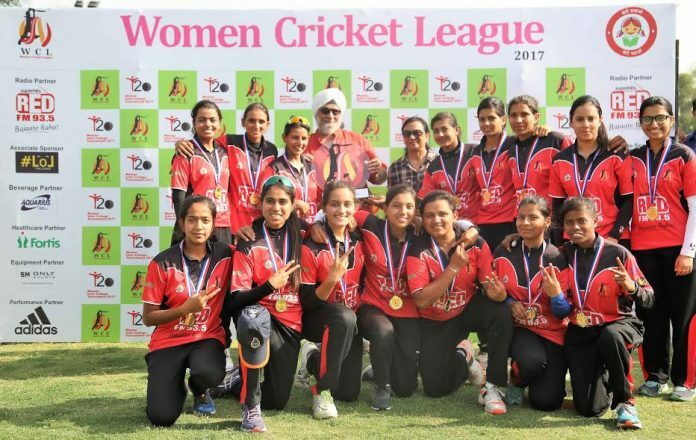 WCL #T20 Inter-College Talent Hunt Tournament was played between six brilliant women teams from Gargi college, Lakshmibai college, Bharti College, KLM Dayanand college, Jesus & Mary college (JMC) and Kamla Nehru College (KNC) of Delhi University from 10th March, 2017 with finals on 24th March, 2017. Gargi College reached finals by defeating Kamla Nehru college by 6 wickets in the Semifinal match and JMC college reached the finals by defeating Lakshmibai College with 99 Runs in Semifinals. · Woman of the Match was awarded to Neha Chillar of Jesus & Mary college (JMC) who bowled 4 overs 5 wickets 12 runs. · Best Player of the Tournament was given to Aarti Dhama of Gargi College who scored 94 runs 2 wickets. Although Gargi college couldn’t win the finals, Ms Shweta Sharma their fast bowler took the maximum no of wickets (11 wickets) in the tournament. Also Aarushi Goyal player of Jesus & Mary college (JMC) scored maximum runs (99 runs) in the tournament. “The main aim of organising WCL’s #T20 Inter-College Talent Hunt Tournament which is first in the series of our activities was to scout the hidden talent to provide exposure and platform to promote Women Cricket in India. We are glad to complete the first initial phase of WCL effectively and plan to initiate the next phase soon to scout more budding talents from across India”Mrs. Vandana Thakur added. The final teams will be declared on WCL’s website. The website www.womencricketleague.com is open to all aspiring woman cricketers for free registration.